In the early 1980s, immediately after the oppressive Robert Mugabe took over power from the racist white Rhodesian Ian Smith, he began to excecute what many have called the 1979 Grand plan of extermination of Ndebele’s. This was succesfully implemented by the Mugabe led Zanu pf regime, through the North Korean trained brutal Shona tribalist Fifth Brigade led by Robert Mugabe’s nephew,the Zimbabwe Minister of Agriculture Perrance Shiri who murdered over 20,000 Ndebeles from matebeland and Midlands provinces. The Vice President Gen Chiwenga was the then commander of Bulawayo’s 1 Brigade , the command centre of logistics for all gukurahundi raids across Matebeleland. This is precisely why Robert Mugabe’s nephew,the Zimbabwe Minister of Agriculture Perrance Shiri and Vice President Gen Chiwenga were always protected by Mugabe, along with President Emmerson Mnangagwa who was the Zimbabwe Minister of state security , leading the brutal CIO and other security organisations. The CIO was key in the genocide and key to Mugabe’s long 37 year dominance of Zanu pf, while Mnangagwa was Mugabe’s clone since the 60s when Zanu was formed. The extermination of the Ndebele’s led to pregnant women stomachs slashed open with bayonets to kill the Ndebele babies , while other women were forced raped, murdered or forced to bury their husbands and sons in mass graves, mines, wells and caves after being shot and killed enmasse by the fifth brigade. What then followed , to date is the aftermath of that genocide, as many families never had their relatives, fathers, sons, daughters, mothers, grandparents, uncles bodies for burial. 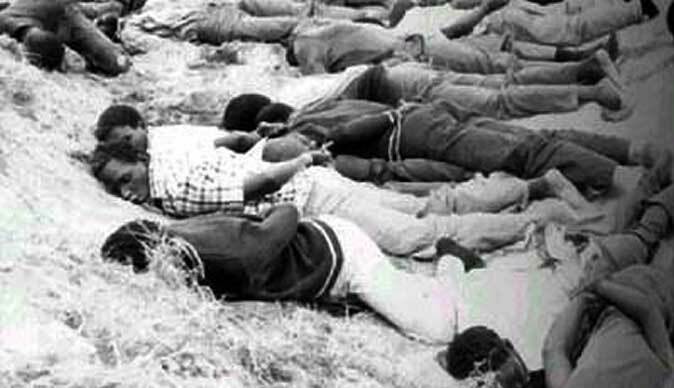 It is common knowledge that, the lack of death certificates , as the government would not issue death certificates acknowledging the genocide, led to thousands of Matebeland youth illegally crossing into South Africa at unofficial entry points, or being helped to cross illegally on false documentation or non at all for a certain fee into South Africa where they were easily settled because of ease of language as Ndebele is originally from South Africa. The thousands of youth then, now adults with children and even grand children, were denied opportunities in their motherland Zimbabwe including being denied Birth certificates, ID cards, education and employment because of the gukurahundi genocide and subsequent Shonalisation of all opportunities in Zimbabwe. Matebeland people found solace in that they can lead safe, prosperous lives with opportunities for the families and descendants and look after their kith and kin back in Zimbabwe, while incorporated into the South African life where they can easily obtain all neccessary documentation and melt into the system. This in itself is why there is so much hatred between Ndebeles and Shonas. It is only after Zimbabweans foolishly saw the removal of Mugabe and replacing him by Mnangagwa as a progressive stance, when, as www.newzimbabwevision.com, always warned, this was of no relevance as the tribalist, oppressive system that Mugabe created and regularly used to oppress Zimbabweans remains intact. It is only after the military shot several people in Harare on two occassions at the start of 2018, that Zimbabweans finally realised, if they thought 20,000 Ndebeles slaughtered was ok, maybe seeing the true nature of the evil they have created now butchering its own in the heart of the capital will shake them up, and it did just that! Zimbabwens were so divided and brainwashed when Mugabe, Mnangagwa, Shiri murdered Ndebeles, white farmers, diamond prospectors in Chiadzwa, carried out Murambatsvina and other hostilities against the people, but now after so much suffering, the reality has come home to sink, because the Mnangagwa Zanu pf militarised regime has no favours, race, tribe or other. In simple terms, if you raise your head above the parapet wall, you are a marked person and when they take pot shots at you, they never miss,..you die! Now they are finally raising their heads out of the sand they have been buried in all along, because they realise that Mnangagwa’s bullets , are not selective . It is therefore imperative that the people of Zimbabwe, all race, tribe, religion, gender, age political or religious orientation, must unite and work together to fight the common enemy, rather that fight against each other. We need unity of purpose in this and stop burying our heads in the sand. We have thousands from Matebeland who have led a life where they have been jeorpadised of everything in life, denied opportunities, birth certificates, ID cards, driver’s licences and education by their motherland Zimbabwe, while daily knowing exactly how and where their family were thrown alive into pits, mine shafts, caves, wells and mass graves, while mnangagwa, Mugabe, Shiri, Chiwenga and Zanu pf deny the genocide,..hmmn! Finally after endless petition by survivors of the genocide and descendants of the genocide victims, Human Rights Organisation and the International World, the Zanu pf regime is coming to terms with reality, that the genocide issue cannot be buried like the victims and silenced, meaning it must be addressed if Zanu pf is to make it to the next election in 2023.